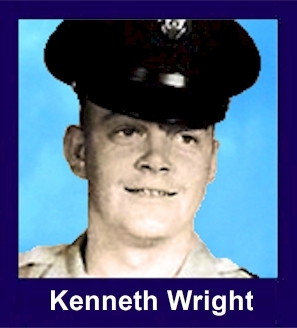 The 35th Infantry Regiment Association salutes our fallen brother, SP4 Kenneth Harold Wright, who died in the service of his country on May 2nd, 1967 in Quang Ngai Province, Vietnam. The cause of death was listed as Booby Trap. At the time of his death Kenneth was 21 years of age. He was from Crane, Texas. Kenneth is honored on the Vietnam Veterans Memorial at Panel 19E, Line 20. The decorations earned by SP4 Kenneth Harold Wright include: the Combat Infantryman Badge, the Bronze Star, the Purple Heart, the National Defense Service Medal, the Vietnam Service Medal, the Vietnam Campaign Medal and the Vietnam Cross of Gallantry with Palm Unit Citation. At 3:15 p.m. on Tuesday, May 2, 1967, Sp4 Kenneth Harold Wright of Crane was killed in Vietnam. He was 21 years old. I did not have the opportunity of meeting Harold, but after talking to many of his friends, I heartily wish I had. The thing that struck me most forcefully while talking about Harold was that, although he has been gone 20 years, everyone I spoke to about him readily remembered him. From everyone I talked to, I heard, Oh yes, Harold. He was a very happy, outgoing, up person. Always in a good mood, ready to go along with the group in whatever everyone wanted to do. He never met a stranger." Harold grew up in Crane about the way our kids do now. His nickname among his friends was "Seldom." He worked various jobs after school and on weekends; then enjoyed "hanging out" with his friends, cruising main street, having a hamburger and coke, attending the football games. One of his after school jobs was as a checker and stocker at the Webb Grocery Store, which is now the Circle M Grocery. Mrs. Webb remembers Harold as a courteous, outgoing boy. She said, "He was just one of the boys, except he was not overawed by grownups;he would say just what came into his mind. Usually something very funny." In school Harold was known as the class comic. He did not like school very much,was known to sleep in class whenever the opportunity presented itself. He thought of school as something that had to be "gotten through" so he could get on to his real interest;working. One of his friends said that about the only way you could distinguish Harold from the other boys in their group was that he always had money in his pocket that he had earned from his jobs, while the rest of them were generally broke. Harold was very close to his dad, wanting to follow in the footsteps of his father and work in the oilfield. He was able to accomplish this for a few years after leaving high school and before entering the service. One of his friends who worked with Harold in the oilfield said, "He made a good hand. If things got real rough on the job, you could always count on Harold to come up with something funny to take a little of the pressure off." Harolds "up" attitude went with him to Viet Nam. His brother, in a previous article, said his letters from Nam always indicated high morale. Harold received both the Purple Heart Medal and the Bronze Star Medal. The following excerpts from the posthumous presentation exemplify the type person Harold was. "Kenneth Harold stands in the unbroken line of patriots who have given their lives that our nations goal of freedom and peace may be maintained. I hope that this award and the knowledge of your sons invaluable contributions will serve to comfort you in the days that lie ahead." "For meritorious service in connection with military operations against an armed foe in the republic of South Vietnam. From September 1966 to May 1967, Specialist Four Wright distinguished himself while serving with as a mortar crewman in Company C, 2/35th Infantry. Soon after arriving in Vietnam, he was promoted because of his initiative, devotion to duty, and willingness to learn. Displaying outstanding leadership characteristics and knowledge of military subjects, he molded his squad into a superior example of proficiency and accuracy." "His cheerful attitude and enthusiastic spirit were an inspiration to all who came in contact with him. Specialist Four Wright was mortally wounded on May 2, 1967 by an enemy land mine. His excellent leadership, enthusiasm, and endurance are in keeping with the best tradition of the military service and reflect great credit on himself, his unit, and the United States." Harold is survived by his parents, Mr. and Mrs. Elbert G Wright of Comanche, Texas; his brother, Norman and sister Carolyn E Luckie, both of Comanche; and another sister, Mary K Dean of Crane. They have just reason to take great pride in Harold. The Moving Wall, a half scale replica of the Vietnam Veterans Memorial in Washington D.C., was in Big Spring, September 30 thru October 5. The entire 58,022 names of those who were killed or listed as missing in action in Vietnam appeared on the replica as well as original memorial. Of those 58,022, there were 3,300 Texans whose names were there. Of those Texans, there was one from Crane. His name was Kenneth Harold Wright. Note: Since this article was written we have been informed by Harolds sister, Mary, that Harolds father passed away in 2001, and that his brother Norman passed away in 1999. Harold is now survived by his mother, his sister Carolyn, and his sister Mary. Presented to Specialist Four Kenneth H Wright for meritorious service against an armed hostile force in the Republic of Vietnam. Specialist Four Wright distinguished himself while serving as a mortar crewman in C,2/35th Infantry. Soon after arriving in Vietnam, he was promoted because of his initiative, devotion to duty, and willingness to learn. Displaying outstanding leadership characteristics and knowledge of military subjects, he molded his squad into a superior example of teamwork, proficiency, and accuracy. His cheerful attitude and enthusiastic spirit were an inspiration to all who came in contact with him. Specialist Four Wright was mortally wounded on 2 May 1967 by the detonation of an enemy land mine. His excellent leadership, enthusiasm, and endurance are in keeping with the best traditions of the military service and reflect great credit on himself, his unit, and the United States Army.